Octave effect market is well saturated with advanced models which all try their best to offer as many features as they can, while also bringing the user a performance that is on par with the expectations. Mooer took a different route and decide to make the most basic, at the same time one of the best octave pedals you can get at the moment. They focused on keeping the form factor in the compact category, which would open up this pedal to those who don’t like or have room for bulky designs, and those who want a stealthy pedal to work with. Needless to say, they have succeeded and that is why we have the Tender Octaver in all of its glory. When we said this was the most basic octave pedal, we weren’t joking,. There is nothing outstanding feature-wise on this unit. It comes in a slim enclosure that is made of high quality aluminum alloy, capable of taking all sorts of abuse. The color theme of choice is a single color design that reflects the simple nature of the Tender Octaver perfectly. The controls are as basic as they come, but are made with quality in mind. This pedal comes with true bypass, which is definitely a good addition to what is a rock solid core performer. 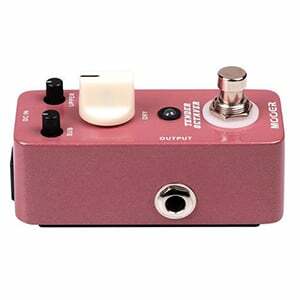 Supplying this pedal with power is standard, meaning either a 9V battery or a power adapter. Mooer might have designed a spartan like effects pedal, but they have made sure that all of their components are up to the task. There are three knobs in addition to the stomp switch, and all of these components are high quality stuff. The knobs allow you to adjust the blend of the effect pedal and source signal, as well as control the level of the upper and lower octave. Even though it is simple, performance wise this pedal stacks up comfortably against the most legendary octave pedals you can think of. The tone it offers comes across as organic, without any of that artificial sounding vibe. Whether or not you would want to use this effect pedal for a professional performance is completely up to you. The pedal can most certainly keep up with you should you decide to go for it,. That is rather comforting considering how not many models are actually capable of delivering that type of performance, despite what the manufacturer claims. Simple is sometimes better, or at least as good as the more complex configurations. 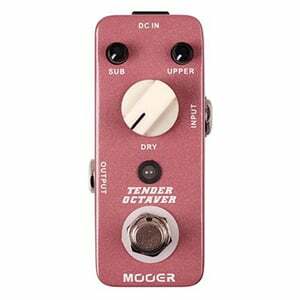 Mooer Tender Octaver is the proof of that when it comes to octave pedals in particular. This is not going to be the Swiss army knife of octavers, however its value comes from the rock solid core performance it brings in large quantities. Tender Octaver is designed for a no-nonsense guitar player who needs a stompbox that works when they need it to, and is as easy to use as possible. That type of policy is exactly why this model has become so popular. 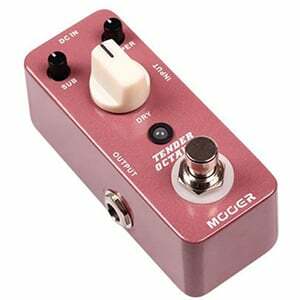 For more info about the Mooer Tender Octaver, click here.